Prior to the 2010 baseball season, Detroit Tigers fans and fantasy baseball players knew the name Armando Galarraga, but most of America probably didn’t. By the middle of the 2010 season, he was a household name across the country. You must know the story by now: Galarraga recorded the first 26 outs of a would-be perfect game against the Cleveland Indians. The 27th batter hit a ball between first and second base that was fielded by Tigers first baseman Miguel Cabrera, who flipped the ball to Galarraga just beating the runner to the bag. But the call was made incorrectly on the field, and the game goes as a one-hitter in the record book. The thing is, if that’s all that happened, the sports world may have moved on quickly. But the indelible image of that day isn’t just the call at first base. The things that are remembered are the great deal of class and grace that Galarraga displayed in what was surely a stressful situation and the thoughtful way he spoke of the umpire, Jim Joyce, who acknowledged the mistake after the game. Throughout it all, he was sportsmanship defined. On the field, Galarraga was effective, perhaps even more so than his year total numbers indicate. For the year, Galarraga was 4-9 with a 4.49 ERA, with 51 walks and 74 strikeouts in 144 1/3 innings. But he had three poor starts in September that weighed down his overall numbers. Outside of those, Galarraga posted a 3.79 ERA in his other 22 starts combined. Galarraga became available this offseason when the Tigers chose to go in a different direction for their 40-man roster, and for the D-backs, it was a great opportunity to add to the depth of veteran pitching, and add to the competition for work in Spring Training. To acquire him, the D-backs sent minor league pitchers Kevin Eichhorn and Ryan Robowski to Detroit. The D-backs will welcome Galarraga into the mix, not necessarily because he’s a classy guy, but because he’s a pitcher who has had some success in the big leagues and can be helpful to the staff. But for an organization that made a concerted effort to improve its culture in the clubhouse and on the field, the fact that Galarraga is a classy guy certainly helps. The D-backs’ most significant move so far this offseason was the trade that sent third Mark Reynolds to the Baltimore Orioles for a pair of right-handed pitchers. Those pitchers — David Hernandez and Kam Mickolio — will add depth to an Arizona bullpen that is getting stronger by the day. Hernandez is the key piece in the deal, as he experienced some real success after being moved from the rotation to the bullpen last year, which suits him in part because he is primarily a two-pitch guy (fastball/curve combo with an occasional changeup). He made his last start of the year on May 21, and from then on was quite good. In his last 33 games, he threw 37 innings with a 3.16 ERA, with 45 strikeouts and 13 walks. Hernandez’s opponent-hitting numbers were solid in that time, holding batters to a .236 average, .310 on-base percentage and a .371 slugging percentage. Hernandez should easily slide into the back of the bullpen for the D-backs this season, as his stuff should work in a late-inning role. 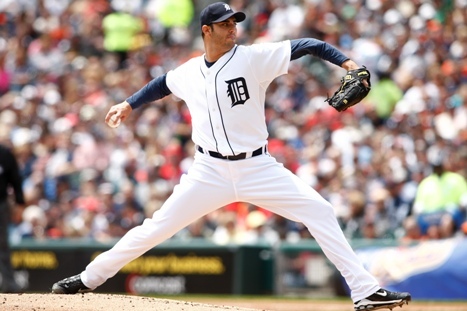 He dials up his fastball in the low- to mid-90s (average fastball was 93.6 MPH in 2010). Mickolio is a bit more of a mystery, as he has less big league experience. He’s pretty huge — 6-foot-9, 255 pounds, which I think makes him the third-tallest D-backs player ever, after Randy Johnson and Jon Rauch — and has made a handful of appearances for Baltimore over the last three years. In that time he’s posted a 4.32 ERA with 26 strikeouts and 14 walks in 25 innings. His ERA has been high at Triple-A the last two years (5.80 in 2009 then 6.37 in 2010) although his strikeout and walk rates were essentially the same as when he was quite successful there (1.80 ERA) in 17 2008 games. He might well be an example of ERA being a poor way to judge a reliever. Random note: Mickolio was born in Wolf Point, Mont. and went to high school in Bozeman, making him one of only three Montana natives playing in the big leagues right now (along with Taylor Tankersley, who was born in Montana but didn’t go to H.S. there, and Rob Johnson). There have only been 26 Montanans all time in the big leagues.